The bubbles in beer are important. When carbon dioxide is dissolved in a beverage it is said to be carbonated and when nitrogen is dissolved in a beverage it is said to be nitrogenated or on nitro. The level of carbonation or nitrogenation can make or break a beer and the kind and size of the gas bubbles change the mouth feel and flavor of the beer. Now that I think about it, it was the U.S. Army that instilled my love of beer. I remember singing cadence as we marched, “Tiny bubbles, in my beer, makes me happy, and full of cheer”. Those tiny bubbles form naturally as carbon dioxide (CO2) is released during the fermentation process. To keep from having to use expensive equipment, most breweries and home brewers alike release the majority of the CO2 produced during the fermentation process. If you have ever seen bubbling buckets of water sitting next to the fermentors at your local brewery, you might have wondered what they were for, so let me explain. The water in the bucket acts as an air lock keeping the oxygen and living organisms in the air out of the fermenting wort that is being converted into beer. As the pressure of CO2 builds in the fermentor to a high enough level, it overcomes the resistance of the water in the bucket and bubbles out. The disadvantage to allowing the CO2 to vent during the fermentation process is that it leads to rather flat beer and thus those tiny bubbles must be added back into the beer sometime before it is served if the carbonization is not at a desired level. To add carbonation back to the beer after it has been removed from the fermentor, the brewer will either force carbonate the beer or let it occur naturally through more fermentation but in a pressurized vessel such as a bottle. When fermenting in a bottle to produce carbonization, the process is referred to as bottle conditioning. 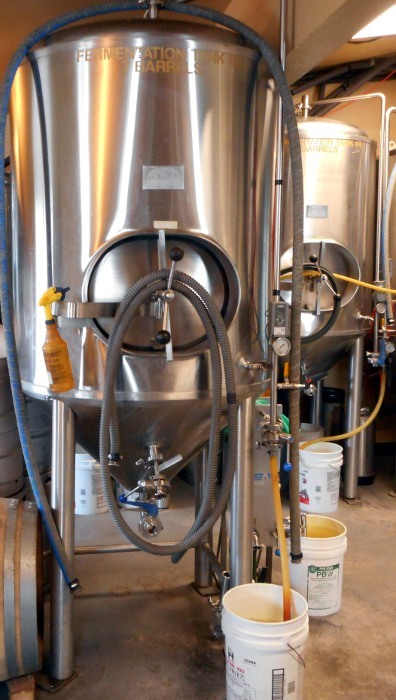 To force carbonate the beer the brewer will connect the vessel, usually either a keg or a brite tank, to a source of pressurized CO2, usually a gas cylinder, and pressurize it for a period of time. In the case of a keg it is usually rocked back and forth to encourage the beer to absorb the CO2 and in the case of a brite tank, there is usually a stone similar to an aeration stone used in fish aquariums to induce the CO2. Unless we are taking carbonic anhydrase inhibitor drugs, CO2 causes a burning and tingling sensation inside our mouth, mainly on our tongue, by diffusing into the nerves and changing the internal ph level to be more acidic. The decrease in the ph level is caused by the chemical reaction of dissolved CO2 in water (H2O) which forms carbonic acid (H2CO3). Carbonic acid can then dissociate to form bicarbonate (HCO3) and a free hydrogen (H) atom. The free hydrogen in turn makes the solution more acidic. Given that this chemical reaction not only happens in our nerves but also in the beer itself, the taste cells on our tongue will sense the acid which triggers the sensation of sour in our brain. From this we can then conclude that the more carbonated a beer is the more sour it will taste. If however, the beer is overly carbonated to the point where a gentle pour of an ounce or two overflows the glass, all bets are off. In fact, if you have too much carbonation you usually cannot taste the beer at all because most of the beer is in the form of head and is thus diluted with un-dissolved CO2. In severe cases you cannot taste the beer because your beer bottle turns into a grade school volcano science project and all of your beer ends up on the ceiling and not in your glass. Unfortunately I have experienced this with bottle conditioned home brew. Usually overly carbonated beer happens when too much priming sugar is used for bottle conditioning, but it can also happen to a keg that is over pressurized compared to pressure it is being pushed with. In the case of over pressurized kegs; this usually happens after a keg being pushed with CO2 has been online for a long time and the beer has absorbed more CO2 from the push gas than was intended. In this scenario the push pressure can be raised to get a better pour but the carbonation level of the beer will still be more than the brewer intended. No matter the cause, a simple fix for an already poured beer that is over carbonated is to wait for the foam to dissipate and agitate the beer slightly by swirling it in your glass to release more CO2. As the CO2 boils out of the beer so does the sour and bite causing carbonic acid and unfortunately so do some of the wanted aromas, but you can always inhale the aromas as you wait for the foam to dissipate. If you do not have enough carbonation your beer it will taste flat. If you have ever let an open beer in a glass sit out over night and then try to drink it the next day, even after you have refrigerated it, you know what flat beer tastes like and it usually is not good. There are a few exceptions though, not all beer needs to be heavily carbonated. Some stouts, porters and even a lambic style beers taste better with little to no carbonation and this relates to the taste sensations mentioned earlier caused by the creation of carbonic acid when carbon dioxide is dissolved in water. However, because most beers taste better with the feel of bite and a slight sourness, most beer is served with at least some carbonation; but, even if the beer has a head or at least tiny bubbles, the tiny bubbles are not always one hundred percent CO2. Aside from carbon dioxide, a blend of about 75% nitrogen gas (N2) and 25% carbon dioxide is commonly used and is generally referred to as beer gas. The idea behind beer gas is that it closely mimics the ratio of just over 78% nitrogen in dry air compared to the other gasses. You should understand that in the old country certain beers were served with a head of air giving it tiny bubbles due to nitrogen being the main ingredient in air. Beer gas reproduces those tiny bubbles but without the beer damaging oxygen. Even though beer gas does contain some CO2, when it is dissolved into the beer, the beer is said to be nitrogenated or on nitro. I should also note that other gasses have been tried such as helium, but the general consensus is that they have no real benefits over nitrogen and/or carbon dioxide. Nitrogen is about fifty times less soluble than carbon dioxide and it is believed that nitrogenated beer bubbles are smaller than carbon dioxide bubbles because of this. Given that the nitrogen bubbles are smaller and there is considerably less carbonic acid thanks to only a small amount of carbon dioxide in the beer, nitrogenated beer has a softer mouth feel and is less sour. The small nitrogen bubbles also make for a more stable head and give the appearance of a water fall as the bubbles get carried down the sides of the glass with the current created from the pour. There are however some disadvantages to nitrogenated beer. 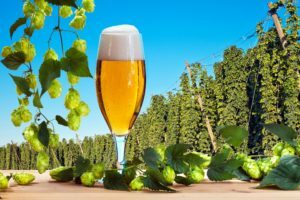 One disadvantage is that it is more difficult to get beer to absorb nitrogen, but with enough pressure and time it is possible. The biggest disadvantage however, is what is perceived to be muted or at least toned down aromas from hops. Given this aspect, beers that are best suited to be put on nitro are porters and stouts where hop aromas are not a big part of the beer’s taste. 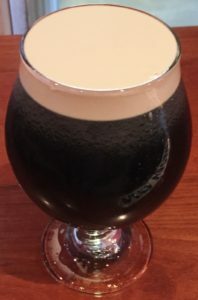 Another disadvantage is that dissolved nitrogen does not foam as easily and thus to get a nice creamy head, draught beer must be forced through a plate with small holes which is why you see nitro pours pulled through a different looking faucet, usually called a stout facet. Similar to draught beer with a special faucet to pour nitro beers, bottles and canned beer that are nitrogenated need to have a plastic widget inside of them to create turbulence to created a proper head. Generally, bubbles do not spontaneously form in beer, they need nucleation. As it turns out, in order to spontaneously form bubbles in the beer the dissolved gasses in the beer need to have an internal pressure that is more than one hundred times the atmosphere pressure which rarely happens with properly carbonated beer. Thankfully nucleation happens when gas is trapped in imperfections of the glass or on fibers in the beer such as from the cloth that was used to wipe out the beer glass. To capitalize on generating bubbles in beer, nucleated glassware is sometimes used where the glass is etched on the bottom to produce more bubbles. Regardless of the gas that makes up the tiny bubbles and the glassware used, tiny bubbles make me happy and full of cheer. What you should keep in mind is that the head of the beer created by those tiny bubbles, leads to aroma and thus the initial flavor of the beer. Though the head might not last long, first impressions are everything and therefore the head is everything to the beer you are about to drink.